Sound Transit will implement positive train control (PTC) on all Sounder trips by the end of 2018, according to Sound Transit Director of Systems Engineering Peter Brown. In a presentation to the Sound Transit board on Thursday, Brown summarized the progress of PTC implementation. In 2008, the federal government mandated that all commuter rail systems implement PTC on all trips by 2020, and show progress on implementation by the end of 2018. 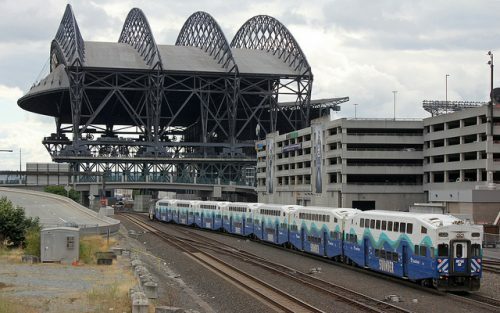 Sound Transit expects to beat the deadline by two years. And then finally I think about how do we create shared public life, civics based institutions. The thing that I think of, as a New Yorker, always is the subway, which is right now a total disaster. But the subway is a little like … The subway in New York is a little like the NHS in England, which is that it really is used by everyone. It is a public thing that people commute to their Wall Street jobs in, and they commute to their nursing jobs in, and their teaching jobs in, and their janitorial jobs in, and homeless people use it, and it is a genuine shared public entity of which we have so few in American life. Not many cities in America have a public transit system used by people from all walks of life. But Seattle kinda does. And the main reason I keep this blog running is that I really want to keep it that way. Because “shared public entities” are at a premium right now. They can give us empathy, help us get over our fears, and help create a shared understanding. Transit in particular gets us out of our steel boxes and into the public realm. And I love it, even if it frustrates me sometimes. I love riding it to work, or with my kids or home late at night. And I want everyone to have the opportunity to use it. I want it to be better. We’re lucky to live in a city with such a diverse media ecosystem that can cover the transit system. But even in Seattle, the landscape for journalism is changing radically. We need your support more than ever. Each year hundreds of donors have stepped up with a generous one-time donation or a monthly subscription to support our work. While advertising does contribute to our bottom line, it is the donations from the small percentage of our readers who provide the lion’s share of our operating budget. This year we hope you’ll consider joining them. This is (hopefully) the last time I’ll bug you in 2018. So go ahead and make a donation before you head out on that holiday weekend. And thanks. Don’t believe the hype on microtransit. 144 affordable homes going in at Mt. Baker. Finally. Construction beginning over Capitol Hill Station. Finally. 3,000 Metro drivers, an all-time high. 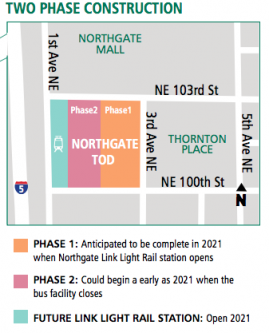 Tweaks to Lynnwood Link Station designs. ST has a new deputy CEO ($), Kimberly Farley, a veteran of many large construction projects. UW Station escalator purchase was penny-wise, pound-foolish. Downtown Bellevue getting serious bike lanes. Study of Center City Connector overruns ($) and delays is itself delayed. There’s a metaphor in there somewhere. JUMP bikeshare eyeing Seattle, but a $2 fee plus docking stations sounds like a loser. Three fascinating articles from The Economist ($): a convincing (!) defense of gentrification, declining public transport ridership worldwide, and e-bikes and scooter companies may be lucrative after all. Dow Constantine proposes $100m from lodging tax to build subsidized housing, on top of $87m approved in 2016. Good points about why affordable housing is especially important around transit, though I have a somewhat more nuanced take. Tacoma Council reviewing Route 1 BRT. Island Transit narrowly rejects fares. The minority is concerned that this leaves the agency dangerously exposed to the next recession. TriMet chief is thinking big. Eugene, OR reducing frequency on its BRT line to four per hour due to low ridership. Oregon now paying a statewide tax for transit. Such a measure is inconceivable in Washington. Roads are subsidized, part XXIV: the opportunity cost of giving up all that land. Last week, Bellevue and Kirkland jointly submitted a $3 million grant application to the US Department of Transportation’s ATCMTD program (Advanced Transportation and Congestion Management Technologies Deployment). That program funds model deployments of new technologies for transportation safety and efficiency. A decision on the grant is expected by October. 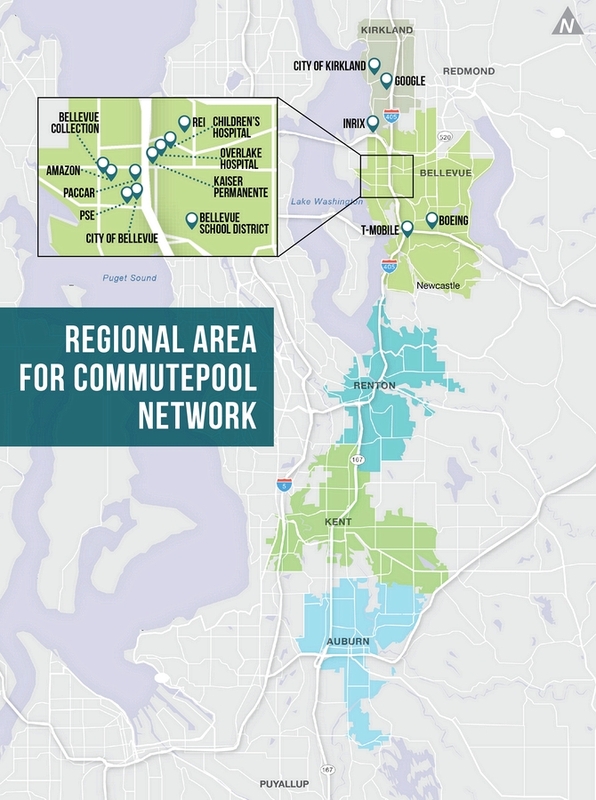 The project also anticipates matching funds from both cities and contributions from major Bellevue employers in the Commute Trip Reduction program. Employers already pay for employee use of vans, so this can be an important source of matching funds. The projected cost of launching the program is about $9 million. Riders will access the system via a smartphone app which Amazon will develop. The app can select pick-up and drop-off locations, find available parking at park-and-rides or leased parking areas, and reserve seats at specific times. Luum, a Seattle firm actively managing commute options at many Eastside firms, will coordinate the program at participating businesses. Bellevue would like to operate the service with autonomous vehicles, but could lease non-automated electric vehicles as needed to start service by mid-2019. An RFP to obtain vehicles is likely soon after the grant is approved. Waymo plans to purchase 82,000 autonomous vehicles for deployment beginning 2019, and General Motors have also said they will deploy autonomous vehicles commercially next year. 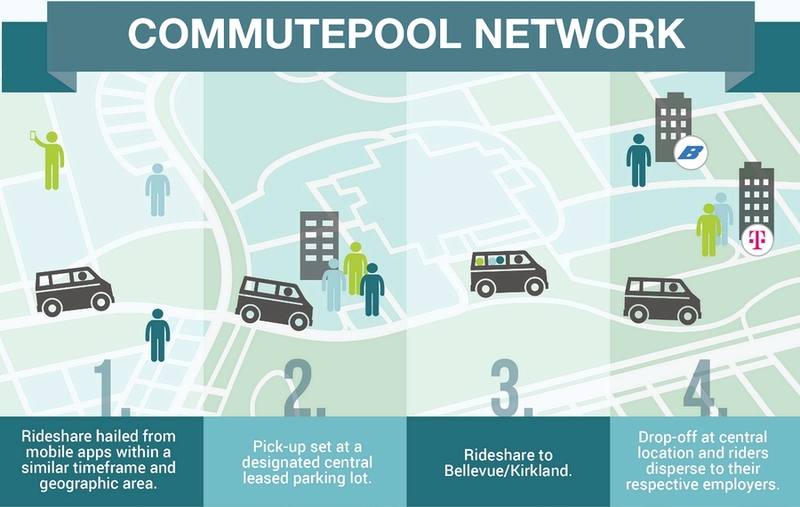 In Bellevue, the CommutePool vans will serve major buildings and designated curb pick-up and drop-off locations. The proposal has buy-in from many of the largest Bellevue and Kirkland employers. Employers with some 33,000 employees on the Eastside have signed letters of commitment to support the program. The City Council voted yesterday afternoon to kill a controversial private bus pilot program proposed by Mayor Jenny Durkan. The pilot was opposed by unions and transit advocates, who mounted a last-minute advocacy push to defeat the program over the past two weeks. The bill will also, as Martin reported, reappropriate unused Seattle Transportation Benefit District (STBD) funds for bus service improvements, and provide ORCA cards to Seattle primary and secondary students. Durkan is expected to sign the ordinance. 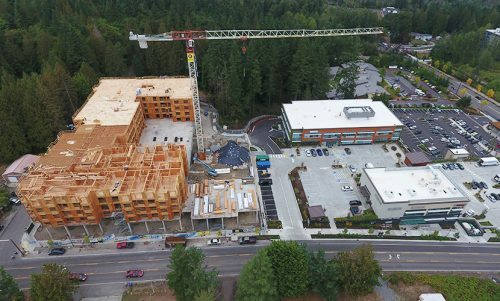 New multifamily construction in Sammamish. Courtesy Sky Sammamish. The Puget Sound region’s extreme growth hasn’t gone over well with some residents. (To put it mildly.) That backlash has caused some frustrating policy snags, like the lawsuit that has placed Seattle’s MHA upzones on hold. 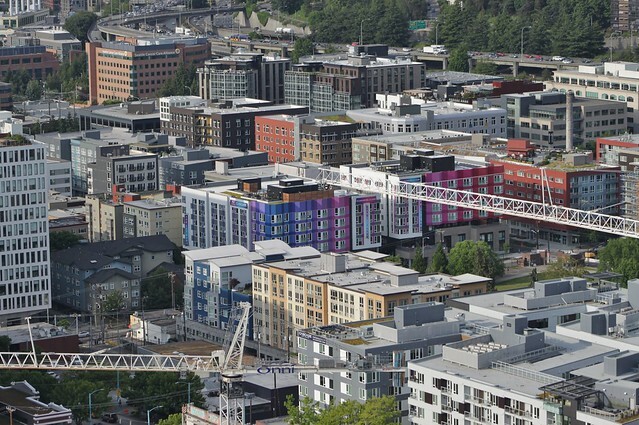 But construction in Seattle continued on plenty of multifamily projects. That hasn’t always been the case in the rest of King County. In recent years, several suburban cities, including Issaquah, Sammamish, and Federal Way, halted construction on new projects by enacting construction moratoria. Under the Growth Management Act, a city can pause work on any or all kinds of new projects by enacting a construction moratorium. The power is broad, but not unlimited. A city has to cite specific detrimental impacts caused by new construction, and use the period of the moratorium to enact code changes that address the problem. A moratorium only lasts six months at a time, but can be renewed indefinitely. Issaquah, for example, renewed its moratorium three times before letting it expire earlier this year. You might think that those laws are the product of NIMBYism. In some cases, that’s true. But the reality is more complicated. Today, Richmond gets a new bus network and a new BRT line named the Pulse. 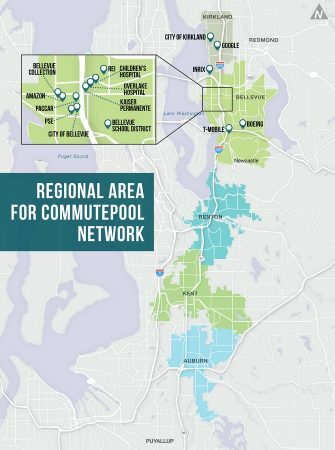 The Transit Riders Union is concerned that Sound Transit is passing up an important opportunity to serve the densest neighborhood in Washington: First Hill. Thousands of constituents in each of your districts commute to First Hill each day. And while we understand that there are some cost concerns with the slightly additional track length and tunneling twice beneath Interstate 5, we urge you to conduct a study of this possibility with sincerity and in good faith. 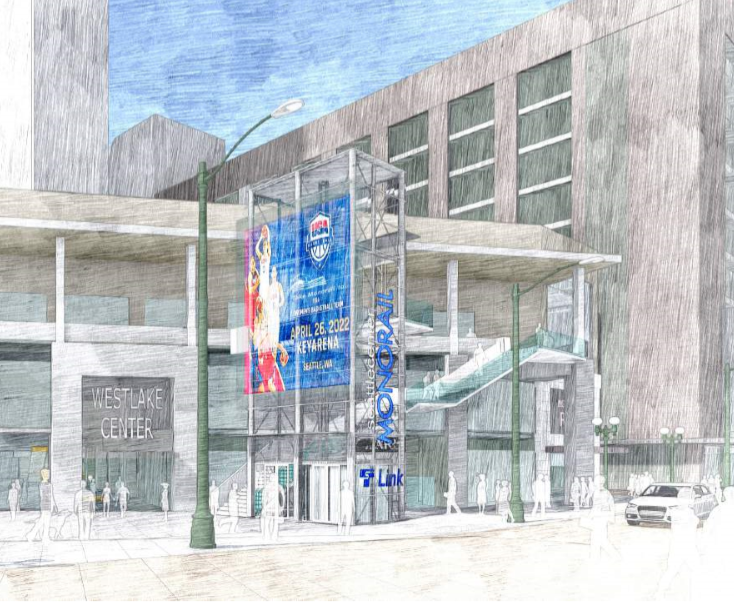 We recommend relocating the Madison Street station from 5th or 6th Avenue to a location between 8th and Boren Avenues. This relocation would make much of First Hill walkable to the thousands of workers, residents, and medical patients. Meanwhile, it would decrease the walkshed redundancy of building a station so close to the existing line beneath 3rd Avenue. First Hill is a large employment center for many sectors, from nursing to administrative to custodial, that historically and presently employ mostly women, and they deserve to be considered equitably in comparison to other regional employment centers with white-collar, mostly male tech workers (South Lake Union) and blue-collar, mostly male workforces (Paine Field), which will rightfully be served upon completion of ST3. Each of these options is unnecessarily sluggish. Imagine if these workers could walk out of King Street Station, cross over the International District Station, and ride in minutes directly to First Hill. 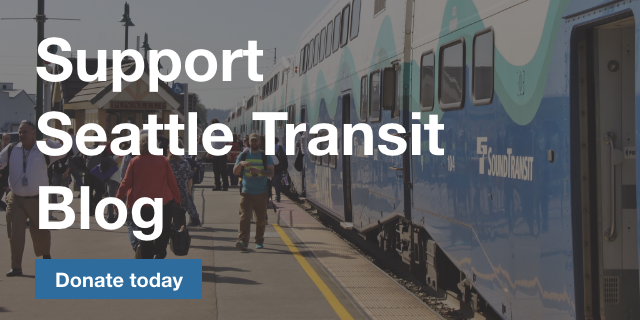 For the many other First Hill commuters whose irregular schedules prevent them from accessing Sounder, they deserve, and would exponentially benefit from, a direct connection the regional Link system. Many people access First Hill for medical services, including many people with disabilities. Disabled passengers, for whom approaching and waiting for a bus on the steep eastbound streets of Downtown Seattle can be difficult or prohibitive, deserve simpler, faster, more comfortable, and more accessible service to First Hill. 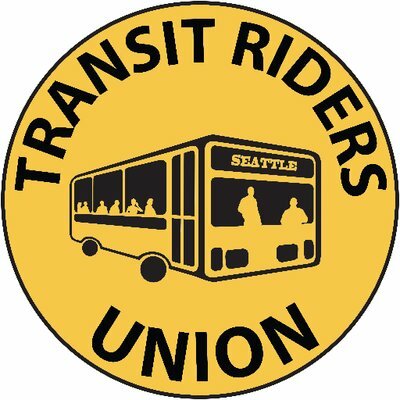 The Transit Riders Union is very grateful for all the work that Sound Transit does for the riding population of the Puget Sound, and we thank you for your consideration of this proposal. Katie Wilson is the TRU’s General Secretary. Sam Smith is the Disability & Access Committee Co-Chair. Paid street parking but without window stickers? Fifteen months after the DSTT, ST announced T-Mobile had service in the Beacon Hill Tunnel, though as of Tuesday evening Bruce Englehardt was unable to use it there. AT&T was supposed to launch Monday, but as of Tuesday had run “into technical issues” and was targeting later in the week for data. A voice signal was available Tuesday morning. Verizon should also follow later this week. Though delayed from its original target of late 2017, this meets the mid-2018 target set last November. As someone who has done most of his transit travel in the internet age, it can be hard to fathom the uncertainty and monotony of riding without an internet connection. While reading a book is a decent substitute for swiping on your phone, the inability to communicate with your appointments, check on the timeliness of transfers, and plan trips on the fly seems hard to live without. Those things were all possible even with an interruption at the Beacon Hill tunnel, but now they require a little less anticipation. 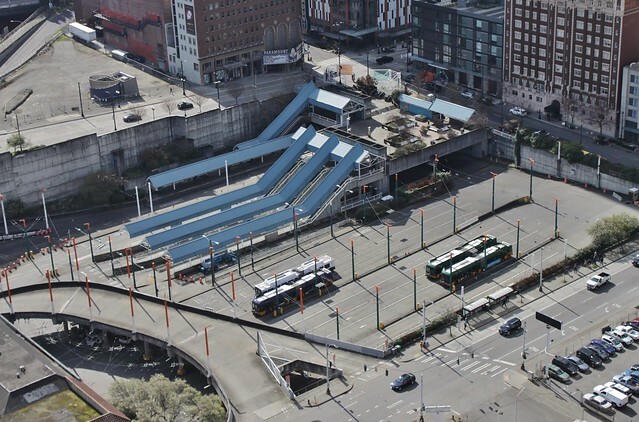 Earlier this month, VIA architecture released its study of the potential for higher capacity and usage of the Seattle Center Monorail. Though activists had been asking for years for ORCA integration to bring the independent line into the fare system, it was the commitment to bring big-time sports back to Key Arena that finally made Seattle serious. Mike Lindblom summarized the key figures ($) in the study. VIA identified a series of improvements that could double the monorail’s capacity to 6,000 people per hour per direction. Each train can hold 300, but 250 is the maximum for timely boarding and deboarding. More than 6,000 would have diminishing returns: at off-peak times today Link can comfortably carry about 2,700 people/hour, expanding as Link goes to higher frequencies and 4-car trains in the 2020s. To get there, the monorail has to fix the cluttered station arrangement at Westlake and make it faster for people to get on and off the trains. Faster loading and unloading (a ponderous process today) can get headways down from 5 minutes to 2.5. The trip itself only takes 90 seconds. A look at a unique automated transit system that represents an idea people have proposed from time to time but never became mainstream. Back in 2014, Seattle voters approved a $60 license fee and 0.1% sales tax for a Transportation Business District (TBD) that would fund bus service through 2021. Originally conceived as a way to avoid bus cuts after a countywide measure failed earlier that year, before the election this was re-framed as an opportunity to increase bus service on overcrowded and/or unreliable corridors that mostly lie within the City of Seattle. Today, the STBD buys about 270,000 annual service hours, equivalent to 41 buses running 18 hours per day, every day. Non-service expenditures include fare discounts, equity programs, the low-income rebate on the VLF, planning and administration, etc. 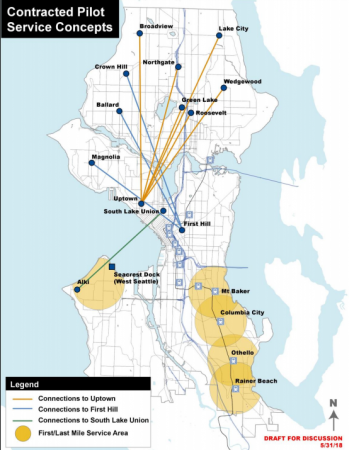 Reduce the threshold for the definition of a “Seattle” route from 80% to 65% of stops. This makes the 106, 120, 124, 345, 372, 373, and E Line eligible for funding by Seattle voters. While these routes have significant suburban tails, most reasonable observers would agree that they are important to Seattle residents. Some of these routes use different Metro bus bases and are therefore not as constrained. Extend free ORCA passes from 61% to 100% of Public High School students, plus “Seattle Promise” college students. 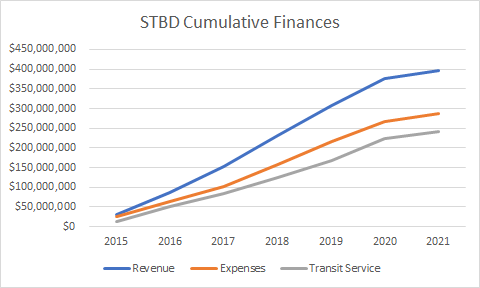 Funding capital transit improvements, both correcting the worst deficiency in the original measure and shoring up troubled projects from Move Seattle. Most controversially, fund “contract pilot transit services” — small, privately-operated transit vehicles to serve markets with unusually high SOV shares (read: Uptown and First Hill) and solve last-mile problems in the Rainier Valley and Alki. The changes sailed through the committee with only minor amendments, but Committee Chair O’Brien postponed the scheduled June 11th review by the Full Council. Kevin Schofield reports that the two-week delay is because labor has some concerns about the fourth provision. It’s probably not surprising that a town like Seattle would have second thoughts about partially privatizing transit services using non-union vendors, even when there is no alternative. However, one might also wonder how effective these services will actually be. It’s hard to scrutinize a concept with essentially no details, but there’s a reason Metro doesn’t send many smallish vans buzzing around second-order demand lines: it’s a very expensive way to serve a small number of people, however much it improves the lot of a handful of riders. 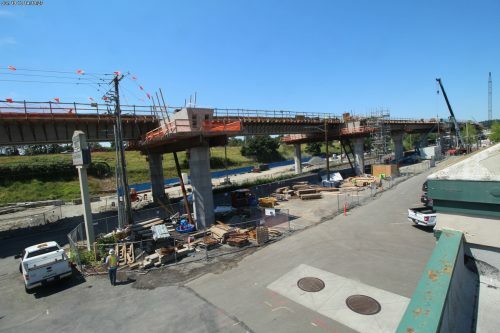 Indeed, some of discussion in June 5th’s meeting cast doubt as to whether the new routes would even make up the 3,000 car trips the city is looking to eliminate during the period of maximum construction through 2021. One hopes that this program would provide reasonably direct and frequent routes while remaining extremely well-integrated with the network of Metro buses. If it does, it would be a worthy augmentation to our transit system. 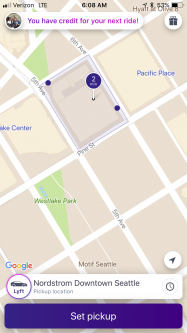 Geolocation around Westlake station. Courtesy of Todd Kelsay. The latest update to Lyft’s app will include a trip planning feature designed to encourage passengers to consider combining rideshare or carpool with transit, walking, and bikeshare. The move comes as part of a large push by the ride hailing company and its arch-rival, Uber, to try and capture a share of the first mile/last mile market. The service will go live by the end of June. Lyft has won contracts with agencies around the country to provide final mile service, and recently launched pilot final mile programs on Mercer Island and in Pierce County. Eventually, ride hailing services could reduce the need for park and ride spaces. “If we can get more people to solve the first and last mile problem with rideshare, that’s good for us. 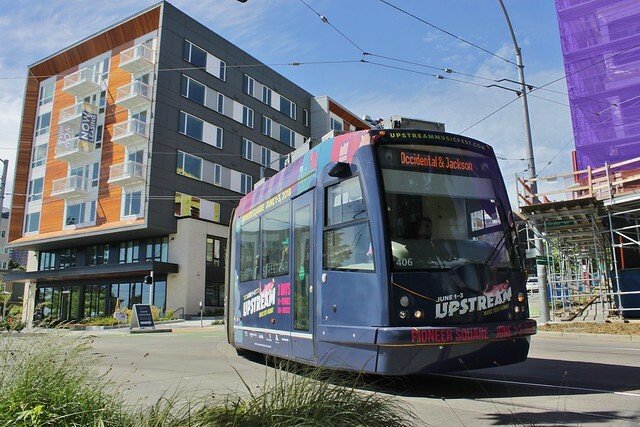 Ultimately, if that gets more people on light rail, or taking buses, that’s good for the environment, and that’s what we’re about,” says Todd Kelsay, Lyft’s general manager for the Pacific Northwest.